What do you do when you've got some fruit that's getting too soft?! I usually use it for cakes or smoothies; I can't stand the idea of throwing food away.... Might have something to do with the pictures I saw from kids in Africa when I was about 4/5 years and didn't want to eat my meals. Mamma: Obrigada! 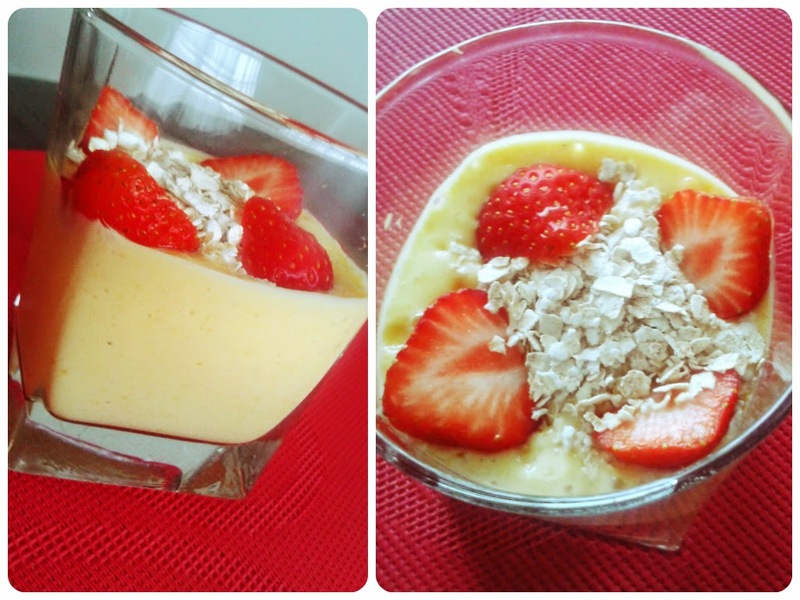 Last Saturday, I decided to use some of the fruit, lingering around, for an healthy, though quick and easy, breakfast. Of course, I cannot put my coffee aside! I need to have coffee for breakfast. Put all this in the blender (except the strawberries) and blend! :-) Add as much milk as you want, until you reach the consistency you like. E está lindo!!! Uma falha minha: nunca experimentei farinha de aveia! Eu faço "a olho" como se costuma dizer. Se gostas deles mais líquidos, junta mais leite do que iogurte, se preferes mais espessos, é juntar mais iogurte do que leite. O giro disto, é que nunca ficam iguais e é uma excelente forma de se beber/comer fruta!